I have a Facebook friend that has been posting photographs that he takes from around town. He has them in an album titled, “Self Portraits”. A new one shows up on my news feed every couple of days. At first they just seemed like the passing whimsey of another person, but I now look forward to the emotional impact they have. It is like I am taking a walk around Alameda – a walk where I am present to all that is and taking the time to enjoy the simple beauty of my world. His collection has created in my a deeper sense of connection with my personal world as I move into resonance with the vibration of the art he is creating. Inspired by his walk around town, I decided to start my own self-portrait collection. This morning my self is best captured by the Mr. Lincoln Rose that graces the front porch. 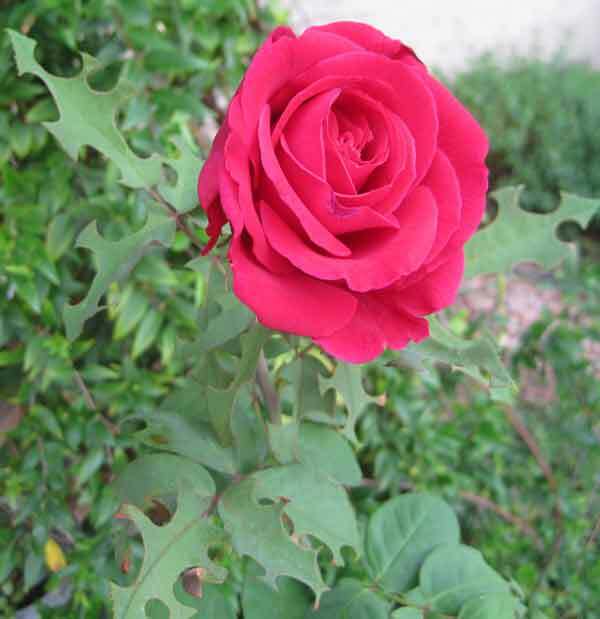 While the rose if lovely and has an awesome scent, the part that truly depicts me is the leaves. Notice that they are all “chewed up”. That would be the work of cutter bees. Cutter bees are so cute. They come and cut out a relatively huge section of leaf and then, with their small bodies and little wings, they try to carry the piece off. It seems more often than not that they drop the piece and need to start over. Last year they almost decimated the gelsemium that grows next to the rose. Apparently they prefer rose, which is the newest addition to that part of the garden. It is nice to be a pesticide free space where I can live in harmony with all that is. I enjoy fostering the cutter bee part of my self. Autumn is my favorite season. I love the cool mornings, the sun with a lower intensity, and the energy as the season shifts. Even though people consider spring to be a season of beginnings, my experience is that autumn is truly a time of beginning in my life. After being cooped up all summer the energy begins to expand outward, but more importantly there is an inward expansion of energy. As we move into September and October we find that the veil between the realms begins to thin and this is a perfect time to cultivate our inner space, clear out the old and begin to plant the seeds that will bring us fruition in the next spring and summer. In the Five Element System, the fall is ruled by the metal element. 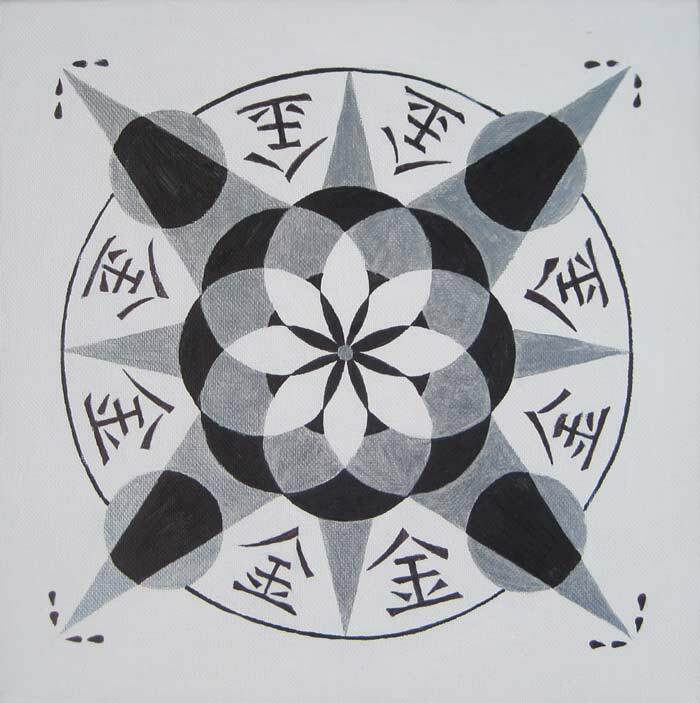 It is characterized by yin energy. And what I am calling an inward expansion is usually referred to as contraction. The wheel of the year passes from the summer where we have full-on vibrant yang energy to a transitional period of balanced yin and yang into a rising yin energy. Right now we are in the balanced period, but I am anticipating the deepening of yin. Autumn begins to see an increase in this yin energy: receptive, quiet, dark. From autumn the yin increases until in the depths of winter we find us in full-on yin energy. While yin itself is contracting and stilling, the overall process of increasing yin is an expansion of yin. Hence I experience expansion within what would be overall considered a darkening, drying and withering phase. When I am living in harmony with the seasons I find that fall is time for nesting and preparing for increased internal activities. It is a time for coming home. We are collecting our energy that was loosed during the year. It is a good time for personal reflection – especially on the gains and loses of the year. As we move deeper into the fall and the winter we will have ample opportunity to process the past year. Emotions may arise from our deep inner pool as we emotionally experience at a greater depth the recent changes in our relationships. Find below the Metal Element from my recently painted series: Mandalas of the Five Element System. Mandala for the Metal Element.